Hailama Farden has been on a mission in recent years, ensuring that the Hawaiian musicians of past generations are not forgotten. In the years when the Hawaii Academy of Recording Arts (HARA) includes an old-timer among the five recipients of Lifetime Achievement Awards, it is usually Farden, a current member of its Board of Governors, who pushes for it. And it was Farden who persuaded Chun to come out of retirement and record this beautiful album. The title says it all. Chun and a great group of musicians play 12 old-time standards in the classic Territorial Era style. Chun sings with a sweet softness that is sometimes missing in the vocalizing of so-called "new traditionalists." Pahukoa Morse (acoustic guitar) and William "Baba" Alimoot (acoustic bass) provide the backing harmonies, and Alan Akaka (steel guitar) and Aaron J. Sala (piano) are also prominent in the arrangements. 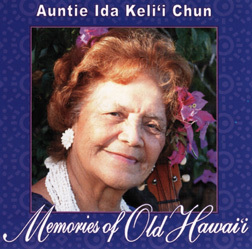 Chun's Hawaiian numbers are charming, and the hapa-haole title song closes this collection on a bittersweet note. The album also contains a bit of mystery. The catalog number suggests that it was originally slated for release several years ago, but the contents are copyright 2005. The absence of lyrics and translations is explained in the credits as being due "to printer's delay." But what was the rush? Classic Hawaiian music never goes out of style. Fernandez is the leader of a group of expatriate Hawaiian musicians who want HARA to allow non-residents to be eligible for all categories in the Hoku Awards rather than just some of them. 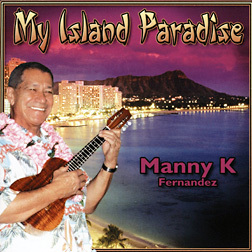 Claiming albums that weren't recorded in Hawaii as products of the Hawaii recording industry seems a more problematic issue than the question of residency, but traditionalists will welcome this album regardless of where Fernandez now lives or where he recorded it. He and his quartet evoke memories of the Sons of Hawaii with "He Ala Nei E Mapu Mai Nei" and "Ke Ala Ka Jeep." They're equally adept with vintage hapa-haole material. Fernandez's careful enunciation of Andy Cummings' lyrics on the title song suggests an affinity with the artists of earlier generations. Fernandez's status as a Hawaii expatriate, however, isn't an issue with Johnny Kai's Hawaii Music Awards. It seems odd Kai chose to define him as "contemporary" rather than "traditional," but a win is a win, and traditionalists everywhere can count on enjoying this ex-pat's music. Aweau has been most visible in recent years for his work with Barry Flanagan in the post-Keli'i Kaneali'i version of HAPA. This impressive foray into instrumental jazz, originally released in November, better demonstrates his range and potential as a composer and recording artist. Aweau displays his musical aptitude with 13 tracks of mainstream jazz. This is not Aweau's first solo project, but it is by far his best. The "one-man band" thing would be problematic is this were a mainstream Hawaiian album, but electronic keyboards have been an accepted element in modern jazz for several decades. The instrument Aweau features here is the six-string electric bass, so the use of synths work in this context. The most interesting selections are Aweau's interpretations of "Hawai'i Pono'i" and "Hawai'i Aloha." Aweau follows in Jimi Hendrix's footsteps by daring to rework the anthem of the Hawaiian nation as jazz. His treatment of "Hawai'i Aloha" does justice to James McGranahan's melody as well. 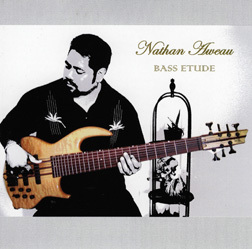 While Aweau provides no information about what inspired the nine original melodies on the album, the inclusion of the bass tunings he uses is a nice touch.